A major search and rescue operation is under way for 12 boys and their football coach who are missing in a flooded cave in northern Thailand. The boys, aged 11 to 15, are believed to have entered the Tham Luang Nang Non cave with their coach late Saturday afternoon. A mother reported that her son never returned from football training that day, setting off the search. During an attempt at dawn on Monday, divers were unable to reach a large chamber deep inside the cave where the students might be, said an official at the forest park in Chiang Rai province where the cave is located. The passage to the chamber is extremely small, flooded and "covered with sand and mud", said Kamolchai Kotcha. Further attempts later on Monday also failed to locate the boys, though rescue teams have found "traces" of them inside the cave, police in Mae Sai district said on their Facebook page. "Right now, our family is hoping that the children trapped inside will have formed a group and are safe and waiting for officials to go in and save them in time. That's what I'm hoping," said Noppadol Kantawong, the father of one of the missing boys. 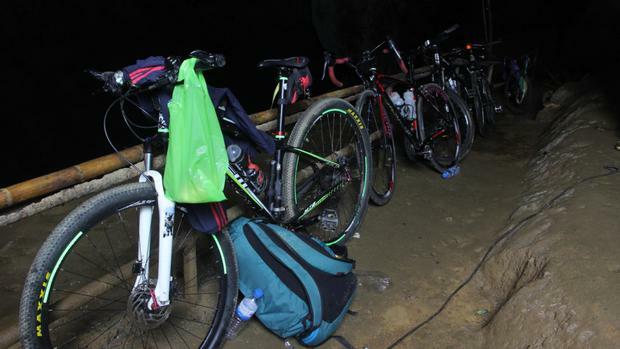 Footage on Thai television showed bicycles and backpacks left outside the entrance to the cave. The area was filled with soldiers and rescue personnel. The cave can flood severely during Thailand's rainy season, which runs from June to October. The large chamber where officials are hoping to find the boys is about 2.5 miles from the entrance of the cave, which is thought to be about four-five miles long. Tourists trapped in the cave by past floods have been rescued after the water receded a few days later.